ABOUT THE GAME	Experience real motocross The only official game featuring MX1 and MX2 championship. Includes the Monster Energy FIM Moto cross of Nations™ . 84 real riders including the world champions Tony Cairoli and Ken Roczen. 12 tracks from real venues, 6 arenas. Trick Battle mode, with more than 30 tricks. Extensive Mud World Tour mode with RPG elem… ents. Realtime deformable terrains and advanced physics for the ultimate MX experience. 12 players online game modes. SYSTEM REQUIREMENTS Minimum requirements Operating System: Windows®XP™ SP2, Windows®Vista™ or Windows®7 Processor: Intel™ 2.4 GHz or similar Hard disk space: 4,0 GB RAM: 1GB Video Card: NVIDIA® Geforce 8800 GT, AMD® Radeon™ HD 3870 or higher (it must be able to manage Pixel Shader 3.0) with at least 512MB of display memory. Online Gaming: Broadband internet connection. Recommended requirements Processor: Intel™ Core 2 Duo / AMD™ Athlon 64 X2 or higher. RAM: 2 GB on Windows®XP™, 3 GB on Windows®Vista™ and 4 GB on Windows®7 Screen: 19” LCD Wide Screen or bigger. Video card: NVIDIA® GeForce™ 9000 series or higher, AMD® Radeon™ HD4000 series or higher (it must be able to manage Pixel Shader 3.0) with at least 512MB of display memory.Laptop versions of these cards are not fully supported. 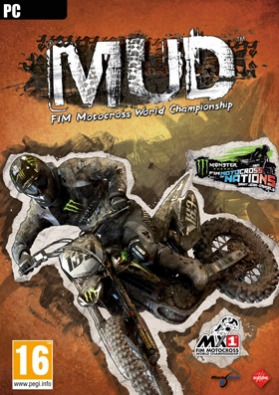 MUD - FIM Motocross World Championship, “MUD” is a registered trademark of Milestone S.r.l.Published by Milestone S.r.l., under its registered trademark “Black Bean”. An offi cial product of the FIMMotocross World Championship, under license of Youthstream Group Lda. Developed by Milestone S.r.l.All Rights reserved. Manufacturers, bikes, names, brands and associated imagery featured in this gameare trademarks and/or copyrighted materials of their respective owners. MX1® and MXoN® logos aretrademarks of Youthstream Group Lda. MX-Life.TV® is a trademark of Youthstream Media s.a. All rightsreserved.Dolby and the double-D symbol are trademarks of Dolby Laboratories.